Journalists in Iraq are divided on why press freedom is restricted in the country, as some say that some reporters bring death threats on themselves by fake or fact reports. But the world in 2016 was on one side looking from the same angle to Iraq’s journalistic freedoms getting worse. The press freedom in the country of Iraq declined to its worst situation since 13 years ago, as political, criminal, and terrorist forces sought to co-opt or silence the media in their broader struggle for power. Freedom House indicated the 2015s’ degree of extralegal intimidation and physical violence faced by journalists. In Iraq where the government authorities’ forces and other militias increasingly pressured journalists and media outlets to take sides, these problems were most acute creating a “with us or against us” climate and demonizing those who refused to be cowed. At the same time, the Islamic State, so called "ISIS" and other extremists groups continued their violent attacks on the media and disseminated powerful alternate narratives through their own networks, reaching vast audiences without the need to rely on journalists or traditional news outlets. To what extent can members of the media confidently say that freedom of the press in Iraq exists with so many threats made and carried out against journalists? These threats are well documented and originate from JFO. What if there is another reason that scares Iraqi truth seekers, the “journalists”? Just one year from today, the Journalistic Freedoms Observatory warned against the “uncertain future threatening the Iraqi media institutions given the lack of funding and austerity measures,” against the backdrop of falling oil prices, which represent the main revenue source for the Iraqi economy. Iraqi journalists live with uncertainty, never knowing when threats to their lives and livelihoods might be carried out. 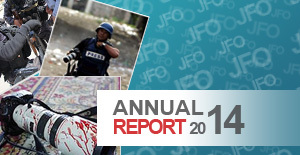 100s of journalists in Iraq have been killed since 2003. It’s even worse for the future of the country where the political parties control media outlets and use them to disseminate their views and policies. Thus, journalists who work for such institutions have to be loyal to these political parties. Meanwhile, independent journalists face a difficult time finding work and therefore they are currently living in a state of destitution and poverty. Looking at the social media side, while the Iraqi Constitution stresses the right of expression, the reality shows that this freedom is restricted; some activists on Facebook are being tried and prosecuted as it is happening still. 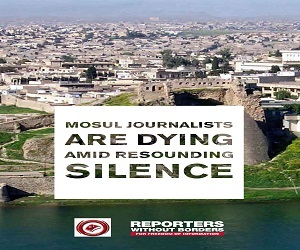 Attacks on both local and international journalists across Iraq have not stopped to this day, as the Iraqi forces advancing in Mosul, reporters became very easy target to the ISIS elements to hunt. 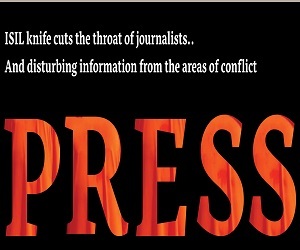 While scores of newspapers and media outlets blossomed across Baghdad following the removal of Saddam Hussein's regime in the spring of 2003, the media renaissance was also met with attacks on both local and international journalists across the country - that have not stopped to this day, as Iraq was and still the deadliest country in the world for journalists every year since 2003. Adding to the overt physical risks from a dangerous security situation and threats of kidnapping - the last case was Afrah Shawqi -, Iraqi journalists are facing threats from the Iraqi government itself, the military authorities and other Shiite militia groups up to 52 of them led by the PMU popular mobility units who fighting ISIS islamists along with the Iraqi national Army near Kurdistan.